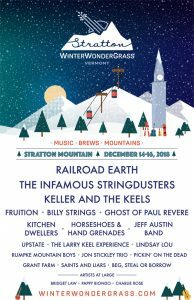 The WinterWondergrass Music and Brew Festival heads to Stratton Mountain Resort, December 14th through 16th! It will feature over 20 Bluegrass and Roots artists in three large heated beer halls and one outdoor main stage! You can catch RAILROAD EARTH, THE INFAMOUS STRINGDUSTERS, KELLER WILLIAMS AND THE KEELS, GHOST OF PAUL REVERE and many more bands over three days. Listed as one of nine “Can’t Miss Winter Festivals” worldwide, WinterWondergrass is one event you shouldn’t miss! Experience wonderful music, craft beer, and fresh eats at Stratton Mountain Resort!